Andrew and Jenny Sinclair are passionately dedicated to combining the best of ‘old world’ winemaking and ‘new world’ innovation, all with with minimal intervention. So only the finest sustainable vineyard practices are used at the stunningly beautiful Cape Bernier. Perched on the rich soils of an ancient volcanic range and tempered by powerful sea breezes, the vineyard’s long slow ripening period produces wines that are incredibly fruit-driven with an abundant intensity of flavours. Absolutely delicious! 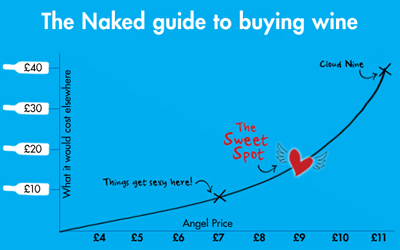 Thanks to guaranteed Angel funding, Andrew and Jenny can now totally focus on nurturing their beloved vineyard to their exacting standards and making the finest Tasmanian wines imaginable, exclusively for Naked Angels - and they are soooo grateful! Andrew and Jenny Sinclair are explorers at heart, and, just as well. When they seized the day back in 2014 and made a seachange from the Sydney burbs to the wild coastline of south eastern Tasmania they could’ve been excused for having a little ‘what-have-we-just-done!’ moment. Their quest for a family life full of discovery and adventure was instantly magnified when they took over the pristine Cape Bernier vineyard - complete with stunning views out to the spectacular Marion Bay and the Tasman Sea beyond. Growing and making wine in Tasmania is incredibly tough, unpredictable, hard work. The prevailing weather is so wildly variable that it’s a constant battle to maintain crop yields and then there’s trying to keep the high costs of being a small artisan producer under some sort of manageable control. It’s not for the faint hearted. And critically, there’s also the harsh reality check that comes with being a tiny boutique winegrower constantly striving to get their labour of love to market, to winelovers who will, well… love it! 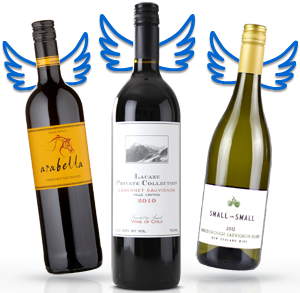 Thanks to guaranteed Angel funding, Andrew and Jenny Sinclair can now totally focus on nurturing their beloved vineyard to their exacting standards and making the finest Tasmanian wines imaginable, exclusively for Naked Angels - and they are soooo grateful! Andrew and Jenny are passionately dedicated to combining the best of ‘old world’ winemaking and ‘new world’ innovation with minimal intervention, so only the finest sustainable practices are used at the beautiful Cape Bernier vineyard.